I have written a post on Old City Gates of Jaipur on nine old gates of Jaipur. Galta Gate is not part of these gates because this was outside the walled city area. This gate has historic relevance as it leads to Galta Ji Temple, an ancient temple complex as well as a popular local Hindu pilgrim in Jaipur. Galta Gate is the shortest way to reach Galta Temples, also known as Jaipur Monkey Temple. Before I talk about Galta Gate, let me share an interesting history of Galtaji Temple. The name Galta is derived from Rishi Galav who as per the local legend worshiped for 100 years. Pleased with his austerity & devotion, the almighty blessed this place with a perennial fountain of holy water. There’s a sacred bathing tank where Hindu pilgrims take a holy dip. During the reign of Maharaja Sawai Jai Singh II who founded Jaipur, many temples were built in this area. Surya Mandir is one of the prominent temples. Galtaji lies beyond the eastern hill range of Aravalis & can be reached either through Galta Gate or Ghat Ki Guni although former is popular due to its proximity to the city. 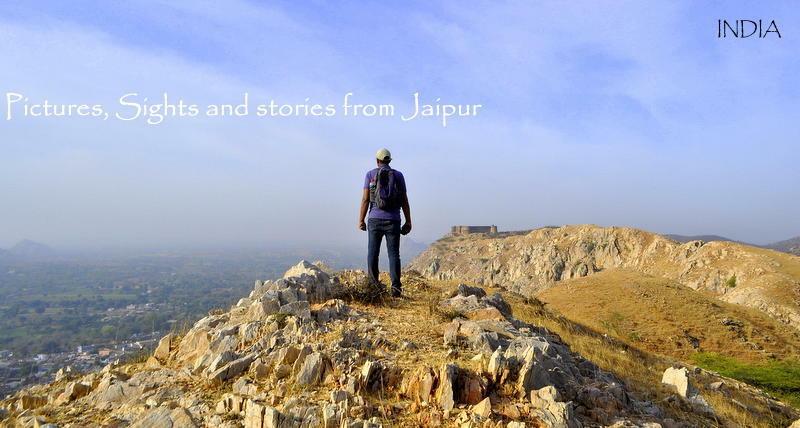 Inspiration for “Jaipur Then & Now” series is 290 years of founding of Jaipur city. Jaipur was founded on 18 November 1727 AD as India’s first planned city by Maharaja Sawai Jai Singh II. Jaipur Then & Now aims at heritage conservation. Here is a picture of the path that pilgrims use to reach Galtaji captured from Galta Gate. This picture was shot by Gobindram Oodeyram, a leading photo studio from 19th century. I’m reproducing a small excerpt from “Handbook of the Punjab, western Rajputana, Kashmir, and Upper Sindh” by John Murray (Firm) Edward Backhouse which journals author’s travel to Jaipur during 1880 AD & describes Galta. Overlooking Sun Temple from Galta Gate. This is how it looks currently. This picture of Galta Gate was shot 150 years after Jaipur was founded in 1727 AD. I ‘m not cent percent sure but it’s likely that the photographer of this picture is Lala Deen Dayal, one of the early photographers in India. Lala Deen Dayal captured the life on Indian streets, famous monuments as well as portraits of royalty during the second half of 19th century. This picture shows Galta Gate as the only standing structure in the area along with few Chhatris (dome-shaped pavilions) on its right & along with sand dunes. Then Galtaji was at the edge of Jaipur city limits, a little further from the Surajpole Gate, which was one of the 9 entry points to the city. Just beyond this gate was a wall which ran all along the perimeter of Jaipur as a fortification. One can see this wall in the above picture. Let me show you another picture which I took earlier this year where I have tried to capture the same spot. The gate still stands where it was but there’s an enormous amount of construction & buildings in the vicinity. Chhatris on its right can still be spotted, a Hindu cremation site. Beyond this gate is a highway which leads to Delhi. The development over 150 years is understandable but the haphazard & unauthorized construction one sees in the vicinity is an eyesore. Due to the populist policies and vote bank, authorities never bothered to check on it. There is a lot of filth near this ancient Gate because its part of a Hindu pilgrim site. People feed cows, monkeys, and other animals with offerings to earn good karma. One often comes across banana peels, grains, fodder strewed all over & animals loitering everywhere. Earning good karma? Or littering? On way to Galtaji temple. A mini zoo? It is not that cleaning doesn’t happen, the area is being cleaned on a regular basis but it is just not enough. To be honest, I prefer not to visit this area because of these reasons. I have mentioned this in one of my earlier post – Surya Mandir/ Sun Temple, Jaipur…Stupefying Views! Litter, animals, unauthorized encroachments, damaged footpath are difficult to bear with. While the government is spending a huge sum of money on private temple trusts in the vicinity, this area has been ignored. Authorities must understand that many foreign tourists visit Galtaji temple because it is a tourist attraction. Galtaji Temple is famous among foreign tourists as Monkey Temple because of a large number of resident monkeys. Tourists on way to Monkey temple. Lamp post installed few years ago with heritage look “died” long ago! Here is another travelers account of the visit to Galtaji Temple. This time from a Banarasi Brahmin – Vyas Ramashankar Sharma who visited Jaipur during 1903 AD accompanying a rich widow Dhanadevi Mahodaya as her personal secretary. It is really a pity to see this entire route from Galta Gate to Galtaji Temple in such a state. It used to be a scenic route and residents would often hike up the Galta hills for a great view. This is still a popular route among residents to reach Galtaji Temple. I’m hoping that authorities will take some action and restore its former glory. At the same time, residents need to do their bit by not littering. All old pictures have been sourced from the Internet. In case, someone has any issues with this post, kindly let me know. Pingback: Jaipur Sun Temple / Great Place For Stupefying View of The City – Jaipur Thru My Lens !! Pingback: Kanwar Yatra/ Photo Walk In Jaipur – Jaipur Thru My Lens !! Previous Previous post: Why Our Attitude Towards Heritage Needs A Big Change?